Pro-skaters and an all-female roller derby team graced the ramps at Kings Heath’s new skate park for its officially opening. The Kings Heath skate park is a multi-use facility suitable for skate boards, bikes and small scooters and is now open to all budding skaters looking to practice their tricks and kick flips. 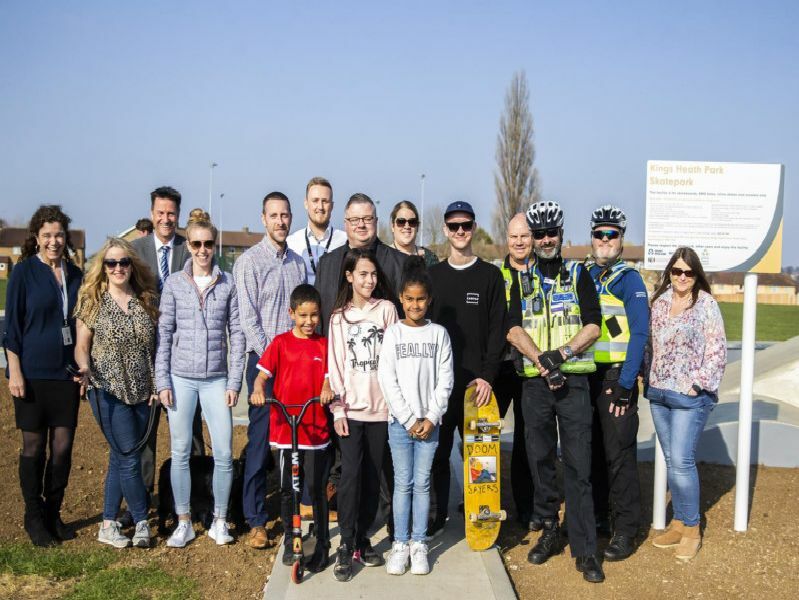 The design of the skate park was chosen by young people in the area who attended the Kings Heath Fun Day in July last year and was joint-funded by Sport England and the Mick George Community Fund for a total of £75,000. Housing organisation Northampton Partnership Homes (NPH) and Northampton Borough Council’s Community Safety Team are also behind the project. Helen Town, assistant director for assets and regeneration at NPH said: “We are continuing to invest in the community at Kings Heath including homes and neighbourhoods. "It’s a priority for us to address communal facilities in the area and offer more activities for young people to do locally. "We’re currently regenerating the shop fronts on Park Square and working with Northampton Borough Council and local youth organisations like Free 2 Talk CIC, we want to continue to provide more opportunities for young people here." Councillor Anna King, Cabinet Member for Community Engagement and Safety at Northampton Borough Council, said: “Our residents’ views are really important to us so we’re really excited to be opening a new facility in Kings Heath, which will not only help keep young people engaged and active, but also meets the community need.” Skate boarding was recently recognised as an Olympic sport and will feature for the first time in Tokyo’s 2020 Olympics. The official opening was on Friday afternoon and was attended by local families, community police officers and councillors. The skate park at Kings Heath Park was officially opened by county councillor Gareth Eales for Dallington and Spencer. The skate park was built by Canvass Spaces. Pro skaters and an all-female roller derby team graced the park on Friday.